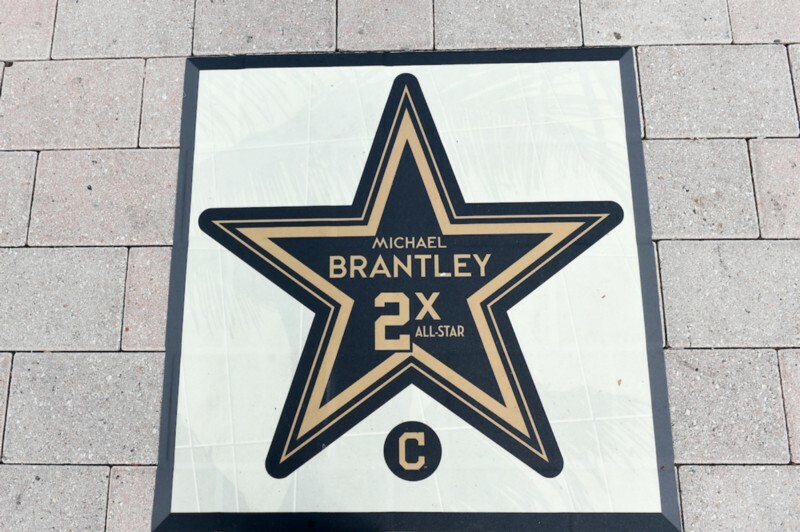 Michael Brantley has been an All Star twice now in his career. his first All Star Game appearance came in 2014 and his second just took place this year in 2017. he was voted in by the players to be an outfield reserve both times. Michael had a hit in 1 of the 2 All Star Games he played in and reached base safely in 1 game. he had 1 hitless game and did not reach base in it. Michael had no multi-hit games, no three+ hit games, and no multi-RBI games. he also did not have any go-ahead hits or go-ahead RBI. the American League team went 2-0 in games that Michael played in. Michael bat .333 (1-for-3) against right-handed pitchers in 2 All Star Games. Michael bat .000 (0-for-1) as a member of the home team in the 2014 All Star Game. he did not hit safely in the game and did not safely reach base in it. he had 1 hitless game at "home" and did not reach base in it. Michael bat .500 (1-for-2) as a member of the away team in the 2017 All Star Game. he had 1 single, 1 GIDP, and 1 total base. he hit safely in the game and safely reached base in it. Michael hit .500 (1-for-2) with 2 outs in an inning in 2 All Star Games. Michael hit .000 (0-for-2) with runners on base in 2 All Star Games. Michael hit 1.000 (1-for-1) with the bases empty in the 2017 All Star Game. Michael reached base once in the 2017 All Star Game only, and he was left stranded once. who left him on base? his Indians teammate, Francisco Lindor. in 2 All Star Games, Michael had no RBI vs. 2 men left on base. Michael also had 2 groundouts versus no strikeouts in 2 Career All Star Games. in the field, Michael played 9 innings in 2 Career All Star Games. he recorded just 1 putout in 1 total chance to give him a perfect 1.000 fielding percentage. as the center fielder in the 2014 All Star Game, Michael played 4 innings. he recorded 1 putout in 1 total chance, yielding a 1.000 fielding percentage. his putout came in the top of the 9th inning for out #1.
as the left fielder in the 2017 All Star Game, Michael played 5 innings. he had no putouts in zero total chances and, therefore, did not have a fielding percentage. now it's time to break down the numbers. 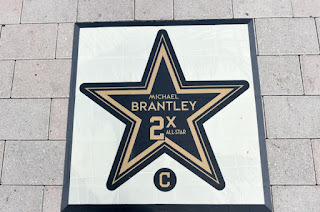 i am going to document Michael's Career All Star Game #s, the 4th spot #s, and the 8th spot #s, as well as the center field #s, the 8th + center field #s, the left field #s, the 4th + left field #s, and overall outfield #s.
Michael played in 2 All Star Games in his Major League Career, none complete. he came in as a defensive substitution in center field in the top of the 6th inning and played 4 total innings in 1 game. he came in as a defensive substitution in left field in the bottom of the 6th inning and played 5 total innings in 1 game. Michael bat 4th in 1 game. now here are my All Star Game numbers and notes. so far in his Career, Michael has 3 plate appearances and 3 at bats in 2 All Star Games (9 innings). in total, he has 1 hit, 1 single, 1 GIDP, 1 first at bat hit, 1 total base, 2 left on base, and 1 putout. well, that's all for now. i have posted a lot in this early portion of July, so if you haven't caught up on everything yet, feel free to read my previous blogs. the Indians get back to business on July 15 and, as always, i will be tweeting about Michael's game performances and any other news i discover. so be sure to follow me @clevelandgirl23. and don't forget, you can sign up for my subscription list to receive email notifications whenever i publish new blogs--just enter your email address in the box underneath the Blog Archive sidebar on the upper right side of this page to join!